Dublin software company Aid:Tech has won the overall Innovation of the Year Award 2018, the ninth year of the awards. The company has developed a secure way to deliver aid and other benefits to people around the world using its blockchain-based platform. It was the first company in the world to deliver international aid using blockchain technology when it helped to distribute relief among Syrian refugees in northern Lebanon on behalf of the Irish Red Cross. Aid:Tech was founded by Joe Thompson and Niall Dennehy after Thompson ran the 151-mile Moroccan desert marathon in 2009. But the money he raised disappeared and that led to an interest in the security benefits of blockchain technology for such endeavours. "We found out that 30% of international aid goes missing each year and we developed a solution which could verify to donors that their money has gone where it was intended," Niall Dennehy explained. Aid:Tech won the IT and Fintech Award last night before going on to claim the top accolade. Over 270 companies registered for the awards this year. Parkpnp, a company which describes itself as the Airbnb of parking, won the Sustainability category last night. Innopharma, which is based in Sandyford in Dublin, won the Manufacturing and Design Award for its work on modified-release drugs. 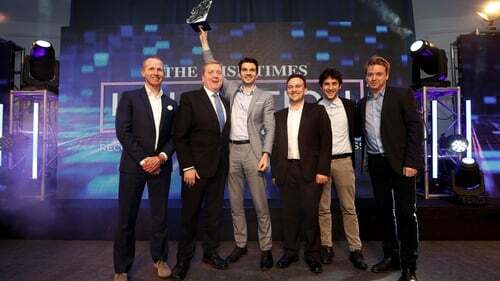 Dublin company BidX1 won the New Frontiers category for its transparent and trusted online auction system which enables people to buy or sell property from anywhere in the world. And Belfast based BrainWaveBank won the Life Sciences and Healthcare award for its "fitbit for the brain" which has the potential to enable much earlier diagnosis of Alzheimer’s and other degenerative brain diseases.